Makes: Makes about 8 waffles. 1In a large bowl, mix together the mashed potatoes, eggs, cream, butter, garlic and some salt and pepper until well blended and smooth. Stir in the Parmesan cheese. 2Add the flour and baking powder and stir just until combined. 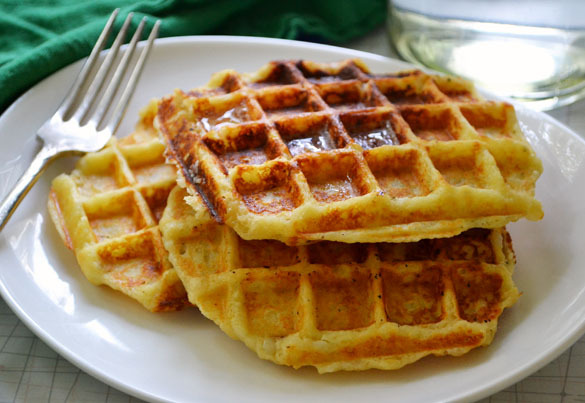 Preheat your waffle iron and spray it with nonstick spray; cook a large spoonful of batter at a time, and leave it until it stops steaming - cook until deep golden and crisp. Serve warm, topped with turkey and gravy or poached eggs and hollandaise. Or eat them straight up, with butter.